Taille de cet aperçu PNG de ce fichier SVG : 800 × 533 pixels. Autres résolutions : 320 × 213 pixels | 640 × 427 pixels | 1 024 × 683 pixels | 1 280 × 853 pixels | 1 875 × 1 250 pixels. English: Flag of the Fascist National Party (Partito Nazionale Fascista) from 1926 to 1943. There were variations of the flag with different styles of fasces, this image shows one of those styles. A variant of the flag can be seen flying atop of a building in the Italian film titled "L’Arrivo della Missione Nazionale Socialista inviata dal Fuerher...", Giornale Luce C0294 del 03/11/1942, shown here in a small version of the film at the Cincitta Luce website at 2:14  in a large version via Youtube at 2:09:  Colour and design has been best guessed at, the white "bands" and other colours are based on a brief colour image of the flag in the film titled Der Führer-besuch in Rom und Neapel at this link  at 0:13, combined with images of other fascist flags and banners it appears to have golden yellow and silver. The wood color used can be also seen at colored images from Hitlers visit to Italy in 1938 here and here. 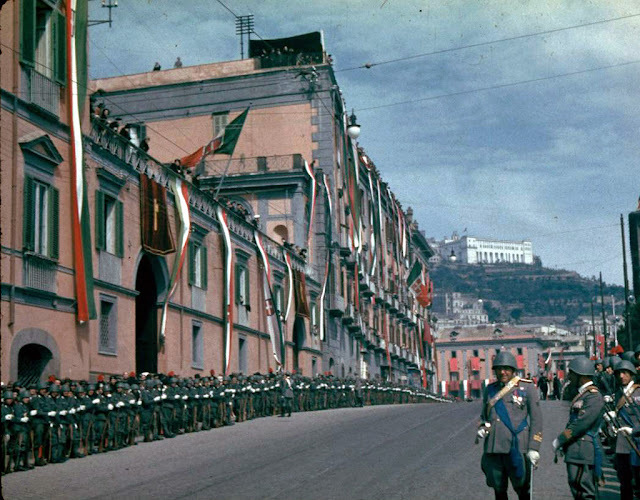 The flag can be seen in a image waving beside the Italian national flag here from 1938 and waving behind Mussolini here in 1942. The book Fascism and theatre: comparative studies on the aesthetics and politics of performance by Günter Berghaus on page 90 describes the use of "the [Italian] tricolour and the black flag of Fascism" in 1934 that "were raised onto the façade of the entrance hall, where throughout the day they were protected by a guard of honour." 18 avril 2015 à 23:32 2 250 × 1 500 (9 Kio) MagentaGreen Color code of the rods changed from "#b58f4b" to "#cbab72" as requested again. 18 avril 2015 à 21:50 2 250 × 1 500 (9 Kio) MagentaGreen Color code of the rods changed from "#ffd323" to "#b58f4b" as requested. 25 mai 2013 à 03:48 2 250 × 1 500 (13 Kio) R-41~commonswiki The golden bands appeared too bright yellowish, made the golden bands the same gold shade as that shown on the crown of the state flag of Kingdom of Italy that this flag flew alongside. 30 mars 2011 à 19:27 2 250 × 1 500 (26 Kio) R-41~commonswiki Minor adjustment, centred the flag to the centre "bar"
Ce document provient de « https://fr.wikipedia.org/wiki/Fichier:Flag_of_the_National_Fascist_Party_(PNF).svg ».